Tableau Friction: Finally - you can use the Tableau data colors in your formatting. 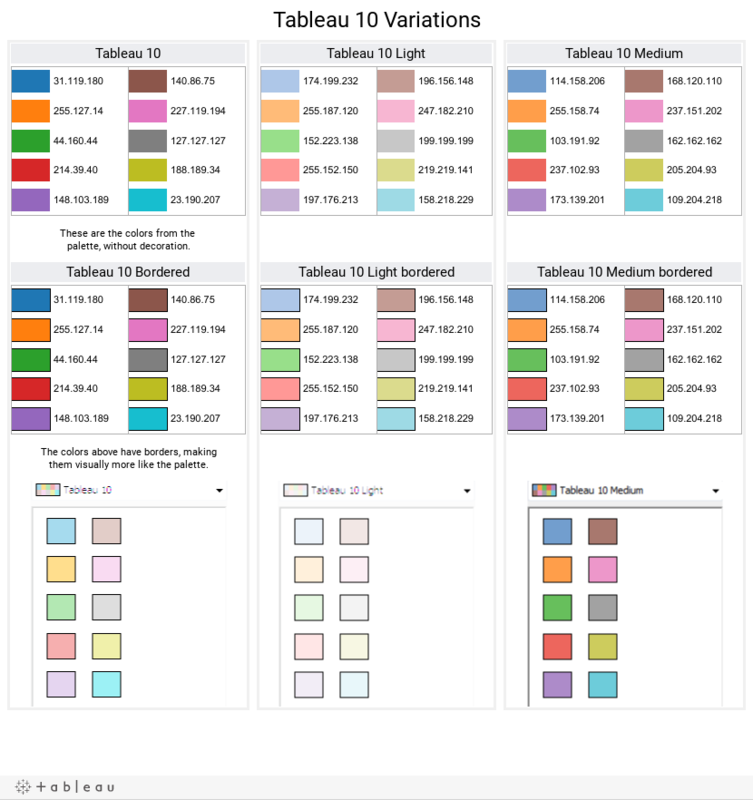 Finally - you can use the Tableau data colors in your formatting. Yes, it's true. You can now harmonize your color schemes by using the Tableau data colors in your formatting. The short version — use the Worksheet below to find the RGB values for the Data Color Palette colors you need and then use those values in the Format coloring of the objects you need colored. One of Tableau's great strengths is its exceptional proficiency at coloring the various visualization elements. The defaults it chooses have been carefully crafted to work very well under a wide variety of circumstances, and Tableau provides a good set of mechanisms for configuring the colors where needed.. It's really frustrating that Tableau uses two different mechanisms for configuring colors, and the colors aren't consistent across them. The colors contained in the data-coloring Palettes are both excellent choices for visualization and fixed sets that can't readily, if at all, be extended or otherwise changed. 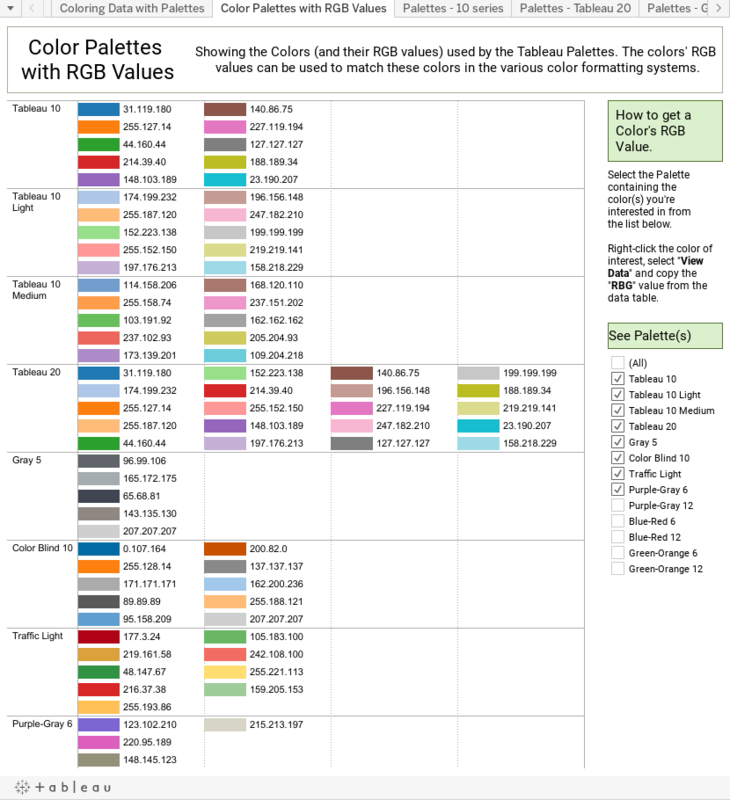 Tableau's formatting systems actually provide two different palettes, but share a common mechanism for specifying the RGB values that specify the full set of available colors. if only.. the RGB values of the data Palette colors were known. But Tableau doesn't reveal them. At least not through its User Interface. The Tableau Public-published Workbook embedded below provides the RGB values for every color in every Tableau data palette so you can use them in configuring the colors in your Worksheets and Dashboards. Everything that can be color-formatted can now use the same colors as Tableau makes available for data coloring. There's quite a lot more to the Tableau color story, e.g. Many of the data colors are used in multiple palettes. Many of the colors are visually nearly indistinguishable from one another. Colors are configured to elements at the data source ‐ explaining why changing the colors in one worksheet changes the colors in others. This is very similar to other scoping situations where Tableau doesn't really notify one that local actions have non-local side effects. When the Automatic Palette is in effect, no specific values are used or recorded. The Automatic Palette uses the same colors as the Tableau 10 Palette. It's not visible, but once Tableau is configured to color field elements it remembers those colorings even when the field is no longer in the data source. This could lead to serious downstream problems. Look through the Dashboards and Worksheets to see more. Thanks for doing this work, Chris! I can't see the tables anymore. So sad! This has been a very helpful resource. Can you explain a bit more, E? I'm looking and everything appears to be OK. So, was that extract refreshed or not?